Wow, that title is a mouthful! Yet I’m still not sure it does justice to what I am sharing in this post. You see, I have many different sealants, glazes, and topcoats that I am practicing with, comparing, etc. And there are many unique applications for these sealants, even within the seemingly small realm of paper quilled jewelry. When people make paper quilling jewelry they often want to make sure the result is water proof, or at least water resistant. There are many sealants, glazes, varnishes, etc. that can be used for this. My goal is to test as many as possible in different applications and share the results to help you choose the one that is best for you! Click here to read more posts about sealants. Today I am specifically comparing four sealants – diamond glaze, 3D crystal lacquer, crystal coat glaze, and glossy PPA (perfect paper adhesive). 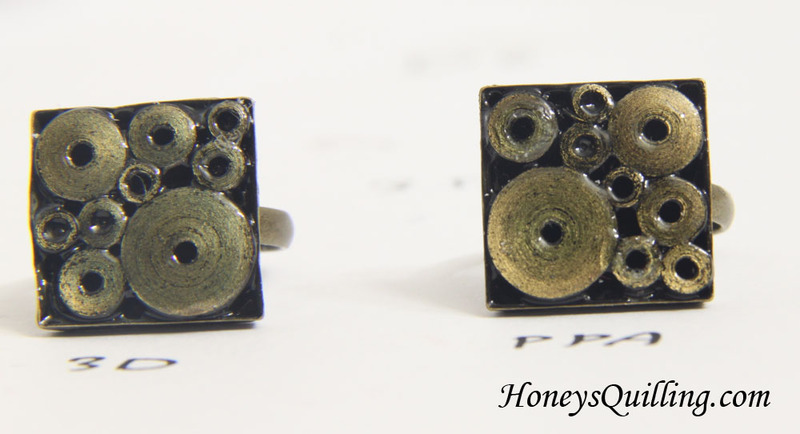 I am also comparing them in a VERY specific application – using gold edged paper and in bezel rings. I will also be comparing these same sealants using normal quilling paper. This particular comparison is ONLY for gold edged paper. I don’t even know if you’ll get the same results with silver edge (I’ll have to test that as well!). That is very important to know because you cannot take the results of this comparison and think you’ll get the same results using it on any quilled jewelry. Having said that, let’s get to the good stuff! ALL – All of these sealants/glazes can be used as both adhesives and sealants. As the first three below are quite thin, there doesn’t seem to be as many practical applications for using it as a glue, but they all work great for gluing down things into bezels, for example. The PPA is thicker and works great as a glue in most applications. All of these sealants left a very shiny smooth surface. Diamond Glaze – This is actually the first time I’m using diamond glaze. I look forward to using it and comparing it on other upcoming projects. I noticed first of all that this is the thinnest of these four particular sealants. It also seems to leave the hardest coat once they are all completely dry. It also seemed to dry the fastest of all three, which is handy! Find diamond glaze at Scrapbook.com, Blue Moon Scrapbooking, or on Amazon . **ADDED NOTE** I have since used diamond glaze on further pieces including this quilled ring and have had great results. I like the harder coat that it leaves! Glossy PPA – This is a paper craft glue, but can also be used as a sealant. It is the thickest of these four sealants. I had to be more careful while this was drying. Since it was thick it took awhile for some unseen bubbles to come to the surface. If I hadn’t been around when they came near to the surface, it would have dried a bit unevenly. Stick around so you can pop any rogue bubbles before they dry near the surface! Find it at Custom Quilling, and on Amazon . Now let’s get to some photos! 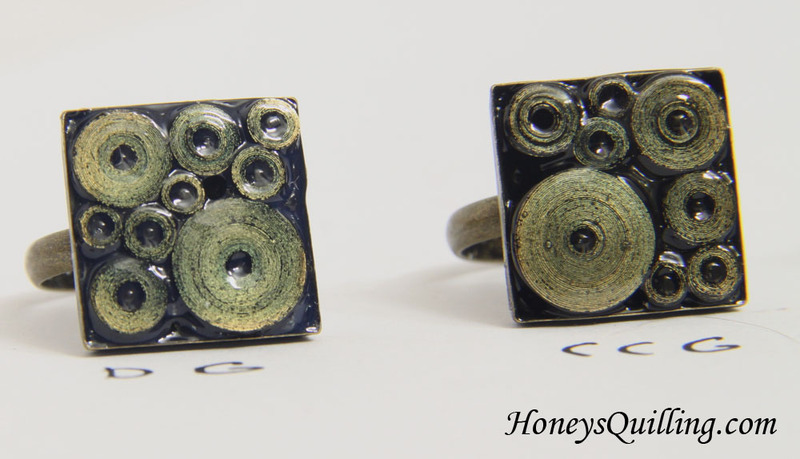 This first photo shows all four finished rings. They have been drying for several days so that I could see the most accurate results. You can see some slight differences between them, I’ll show them closer up in the following photos.. Here is a closeup of the two of the rings. The first has diamond glaze, and the second has crystal coat glaze. The first thing I noticed with the diamond glaze is that it leaves a bit of a blue hue for some reason. This was the most liquid of the sealants and it is also the quickest to dry and has the hardest finish. Here are the next two rings. The first is 3D Crystal Lacquer and the second is glossy PPA. The 3D crystal lacquer again gives a very slight bluish hue. It is very similar to the crystal coat glaze, except that the gold color does not look rubbed off with the 3D crystal lacquer. The glossy PPA I was surprised to see was my favorite for this specific application. The gold color came through true and unblemished. It it much thicker than the others, so you have to be careful to pop the bubbles a few minutes after applying it. 1) glossy PPA – for keeping the truest color! 3) crystal coat glaze – some of the gold looks rubbed off and it has a bit of a blue hue (I’ve used this sealant for normal paper and have seen no problems there). *note* these favorites are only for this very specific application! All of these sealants might work equally well on gold edge paper that isn’t in a bezel like this. When it’s in a bezel the sealant gets poured on thickly, so that may be the reason for the blue hue for the last three. More experimenting is necessary! Here is the diamond glaze next to the PPA, you can see there is quite a difference! 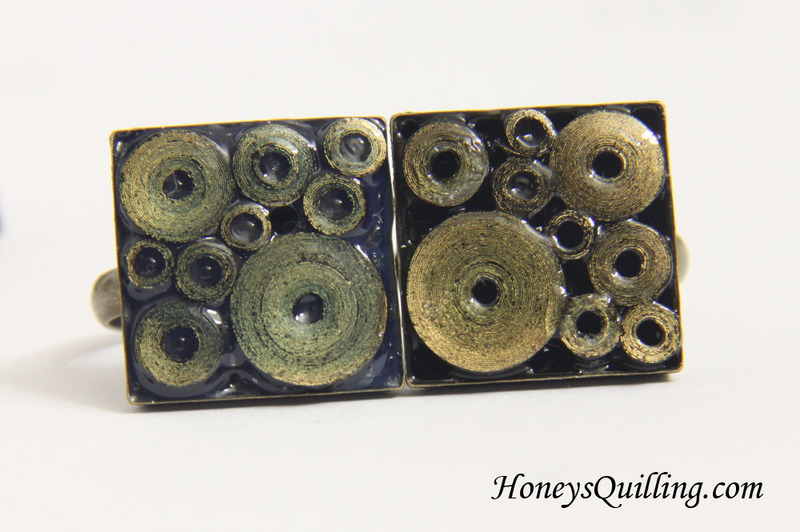 Have you used a certain sealant with paper quilling that you love? Have you used any of the sealants? What are your observations? I have many more posts like this coming! Great experiment and observations Honey! Have you ever tried playing with Mod Podge Dimensional Magic? I’ve often wondered what that’s like. I’ve used the Mod Podge Dimensional – I love it. You need to watch for bubbles. Also make sure you give it plenty of time to cure. On the Plaid website – maker of Mod Podge – they have videos and info on all of their sealants-extremely informative. Have you checked the safety data sheets on all of these? I use DuraClear Gloss Varnish Americana brand made by DecoArt. No blue tint. Non-toxic, non-yellowing, waterproof. Have been using this on my paper beads and jewelry for four years. Did many tests with many sealants. ModPodge Dimensional works great for filling in bezels – though you do need to watch closely for air bubbles and pop them. Thanks for the input, Linda 🙂 I have a bottle of the duraclear varnish, just haven’t tried it yet! I will soon! I have looked at most of the data safety sheets for these products, probably not all, though. Definitely something to keep in mind to compare! Thanks Honey… I have been making quilling products but never applied glaze or sealants but now I know I have to buy some.